That salty, sweetness which smelled oh so good but (when temptation and curiosity became just too much) tasted oh so bad! In 1992, my three-year-old self, received one of the greatest Christmas presents EVER – my first pack of Play-Doh. I happily spent many an hour molding and creating what can only be described as modern art, whilst at the same time inventing a whole new colour – a mucky brown, which can be made by cleverly (or clumsily, whichever you prefer) mashing the once vivid colours together. And the creative juices really flowed once I was given the different instruments that could make the Play-Doh into things like spaghetti and other modeling shapes. The downside, however, was the inability to remove it from carpet – and trust me it was definitely impossible, my mum tried everything! Every kid had Play-Doh, as did most nurseries and primary schools, and for me, it was an essential part of my childhood. Not bad for something that started out life as wallpaper cleaner ay? Back in the 1930s, (and in America no less), a mixture of flour, water, salt, boric acid and silicone oil, was making the rounds as wallpaper cleaner and it wasn’t until some clever children started messing and playing with it that the idea of Play-Doh came about. The squishy substance has come a long way, sporting many colours since it’s original off-white – with gold and silver even being added to the palette in 1996 as part it’s 40th anniversary. 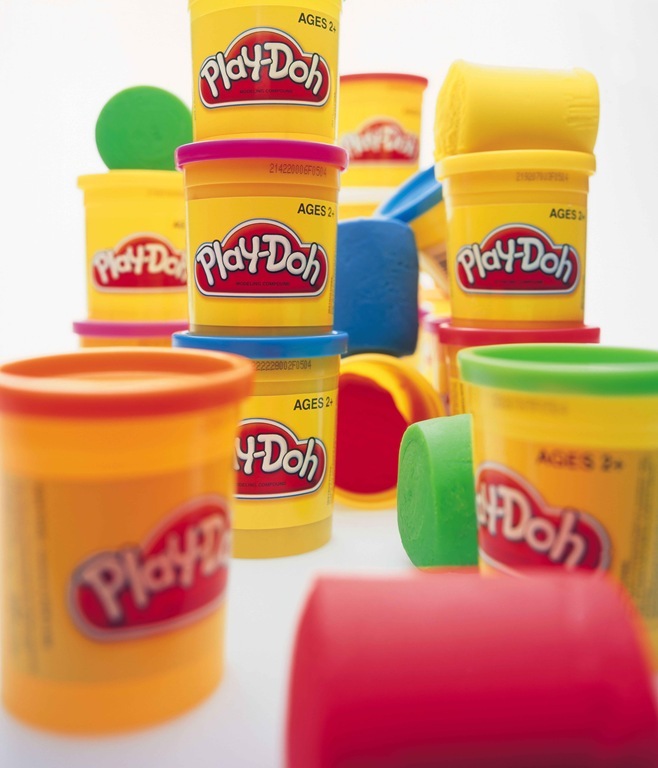 There have also been more than two billion tubs of Play-Doh sold over 50 years, and because of that, in 2003, the Toy Industry Association added it to their ‘Century of Toys’ list. By the 1980s, Play-Doh came in a variety of eight colours, called the ‘Rainbow Pack,’ with four new colours being added to the red, yellow, blue and white. It was also in the 80s that Play-Doh’s packaging had an upgrade. In 1986, we said goodbye to cardboard containers with prone-to-rust metal bottoms, and hello to tight-sealed, easy-to-open, plastic tubs. Even though it was first sold in 1956, it wasn’t until its export in 1964 that we British folk got to experience the joy of Play-Doh, but we’ve been molding and making ever since!